Continuing our 30th anniversary celebration of the A-Team, we focus on another great character...the muscle-bound, gold-chained, and feathered-earringed man who was loved by kids everywhere, "B.A." 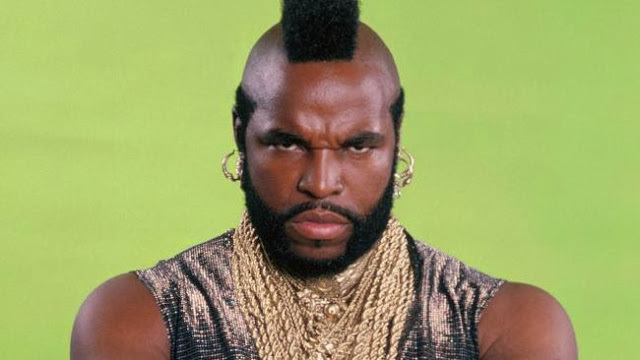 Baracus! Bosco was a jack of all trades on the show, the resident "tough guy" with a soft spot for helping and mentoring kids. He served as the A-Team's mechanic who was also a skilled driver and electronics technician. Today we showcase the best sayings and lingo made popular by "Scooter"...err..."B.A." on the A-Team. Don't be a fool and miss this, sucka! "On the jazz" - When a person gets a crazy idea, often used to describe Col. John "Hannibal" Smith. Example: Referring to a tactical maneuver by Hannibal in the pilot episode "Mexican Slayride," "B.A." says "He's on the jazz, man. He's on the jazz." The phrase is akin to the poker phrase "on tilt." "Fool" - An unintelligent person. Example: "(Murdock) I wish I could just jump in the water and live like a fish. (B.A. Baracus) Shut up fool, you ain't no fish!" The term, however, was also used as a foresight to what an unintelligent person might do..."I pity the fool that steals my van." "Jibba Jabba" - Senseless talking. Example: "I aint get time for your jibba jabba." A phrase usually used in reference to Murdock's crazy antics when in the middle of carrying out a mission. "Gonna pay" - A promise of revenge. Example: "If anyone hurts those kids, they gonna pay." This phrase was mentioned many times throughout the show and was always a foretelling of retribution to the bad guys. "Hey man,..." - A phrase used before giving a piece of advice. Example: "Hey man, I don't want to listen to you putting yourself down." Similar in use to Sonny Crockett's "hey pal" on Miami Vice. "I aint gettin' in no airplane" - A phrase used to express a fear of flying. Example: "I aint gettin' in no airplane, Hannibal." Usually followed by, "I aint letting you drug me this time"
Remember some other sayings or lingo used by B.A. Baracus? Share them with us in the comments.